We placed eggs in our incubator at school a few weeks ago and last Monday and Tuesday they hatched! We had 14 out of 24 hatch. Unfortunately, two perished and two were sick and went to Lowe's farm for some medical attention. The other 10 are happy and growing at school in a big bucket. We will be taking them all to the farm this coming Thursday when we take our afternoon class on their field trip. As you can imagine, this was an exciting week in our Pre-K classroom. The children were beside themselves as they watch the chicks hatch in the incubator and have watched them grow over the week. It's amazing to me how fast they grow! Anyway, here's the "birth" announcement I made to share with the rest of the school. 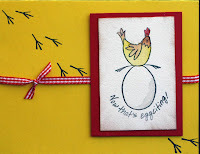 It uses one of my all time favorite Stampin' Up! set, now retired, Best Of Cluck. Left is the front of the announcement, middle is the inside top and right is a picture of our 10 chicks. Enjoy! Very cute!! Several of the families in my homeschool group have hatched chicks. Love the "birth" announcement.